Longan fruit trees can refer to Euphoria longana which is also known as the ‘Dragons Eye’ which has been grown in Australia for over 100 years. Also called Dimocarpus longan. Thought to have been brought over by fishermen and Chinese miners the tree itself is originally from Thailand through to China and to India. It is a tree that requires tropical to sub tropical conditions to thrive. Mostly grown in the Northern Territory where is will produce fruit in late summer. For good fruit production dry winters and wet summers are required, if you are growing the tree as an ornamental it will grow in other climates, fruit production will be limited in wet winter climates. It is possible to provide excellent winter drainage and summer irrigation if needed. Sweet juicy flesh make it attractive to eat fresh. The fruit itself has a brown skin and translucent white flesh. Touted as a ‘superfood’ it has been used in Chinese medicine for centuries. 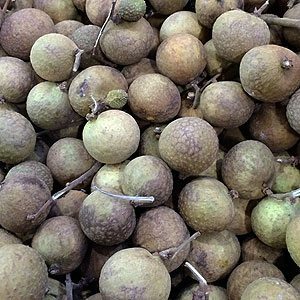 Longan have a very high sugar content. Chompoo – Flesh in tinged with pink. Daw – Good quality fruit and early to harvest. Dang – Mid season harvest.